He gave me permission to use his concern as an “Ask the Bishop” question. Some have noted that I do not spend a lot of time Exchanging the Peace when I am with congregations. I usually offer the Peace to four or five people and then sit down. In fact, I am known to just sit down as folk mill about greeting one another. On rare occasion, I will even announce the offertory sentence just to calm things down if things get out of hand at the Peace. Let’s be clear: The Exchange of the Peace is not intermission and it is not supposed to be a time to say hello to everyone else in Church. Other than the greeting of the Lord’s “Peace” with one another, this isn’t the time for extraneous conversations. This is not the time to discuss vacations, recipes or Aunt Sylvia’s lumbago. The Peace is not meant to last longer than the sermon. It is a liturgical act. What is it? The Exchange of the Peace is part of the liturgy. The Peace is an ancient Christian practice. It has been associated with Romans 16:16 ("Greet one another with a holy kiss") and similar passages (see 1 Corinthians 16:20, 2 Corinthians 13:12, 1 Thessalonians 5:26, and 1 Peter 5:14). The earliest references to the Peace may be found in writings concerning the baptismal liturgies. After the baptism and the laying on of hands and anointing by the bishop, the newly baptized were included in the exchange of the Peace for the first time. Justin Martyr (c. 100 – 165 AD) indicates that during the second century the Peace took place before the presentation of the gifts at the Eucharist. It appears that the Peace originally concluded the liturgy of the word. The Peace was moved to the end of the Eucharistic prayer in the Roman rite during the fifth century. The Peace was exchanged at the time of the breaking of the bread prior to the administration of Holy Communion. The Peace was exchanged at this time in the Eucharistic liturgy of the 1549 Book of Common Prayer, and it continues in this position in the Roman Catholic liturgy today. The Peace was deleted entirely in the 1552 Book of Common Prayer (and in Anglican Prayer Books up to the mid-20th century). 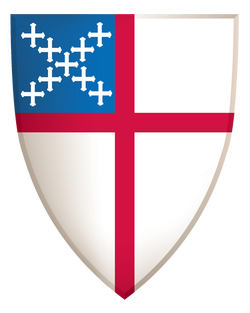 The Episcopal Church’s 1979 Book of Common Prayer restored the Peace at the Eucharist to its ancient position at the end of the liturgy of the word and before the offertory. In our liturgy, the Peace acknowledges the reconciliation of the believer with God and of believers one with another. Notice that most of the time during the Eucharistic liturgy on Sunday, the Peace comes after the confession and absolution and before the altar is prepared for the Great Thanksgiving. We are symbolically acknowledging that we are in right relationship with God being at peace and harmony with one another before going to the altar. In the words of Jesus in the Gospel of Matthew (5:23, 24): “If you are offering your gift at the altar, and there remember that your brother has something against you, leave your gift there before the altar and go; first be reconciled to your brother, and then come and offer your gift.” I have even heard it suggested that we might better hand out cell phones before the Peace to give people an opportunity to put all their relationships in good order before taking the Sacrament. So, local practice might include greeting one another in the name of the Lord through much of the congregation – this will be especially true in congregations of ten or fifteen (the larger the congregation, the fewer the people that can or should be personally addressed). It need not be intrusive and it certainly should not be a time for private conversations. I don’t see any reason for the celebrant or deacon to greet everyone or even to go down every row of seats. It is a symbolic act that should take no more than a few minutes in any congregation. It is a serious liturgical act of God’s people in preparation for receiving the Sacrament. It is also an act of joyfully acknowledging our reconciliation with God and one another. A balance can be reached through teaching and awareness. We do need to be aware that not everyone is comfortable with hugging and personal contact. Likewise, we must respect that it is not necessary to greet everyone. It is most important to greet and be at Peace with someone with whom you have had a disagreement or at enmity before coming forward for Communion. So, it is best to seek out those with whom you have a problem to Exchange the Peace of the Lord before bothering with your friends or those you love – they don’t need it. Be joyful, be respectful, but please no personal conversations. Don’t worry about what others do. Don’t impose your need to greet, hug or share the Peace on someone who is uncomfortable with the intrusion (and sitting quietly at their seat). And remember, we are sharing the “Peace of the Lord” as we prepare to receive his “most precious Body and Blood.” This is not intermission or the seventh inning stretch. For a good congregational study and discussion about the liturgy, I have made two suggestion in my “Bishop’s Reading List” for 2014. First, I recommend Liturgical Sense: The Logic of Rite by Louis Weil (Seabury Books, 2013). Weil has taught liturgical and sacramental studies at three Episcopal seminaries. He is one of the generation of scholars that shaped the current liturgical practice embodied in the Book of Common Prayer (1979). His (140-page) analysis of the liturgy and his reflection on popular practices is a worthy aid to help us review the worship habits in every local Episcopal Church in Hawaiʻi. I suggest reading it with The Liturgy Explained (New Edition) by James W. Farwell (Morehouse, 2013). These two short books (Farwell’s book has only 56 pages) could do much to enhance the style and teach the meaning of worship practices in our congregations.